Buy through MusicWeb for £13.49 postage paid World-wide. Members of the British Music Society may well remember Brian Daubney who was for some time Chairman of the Society and Editor of the newsletter. He was and remains a dedicated champion of the music of Benjamin Burrows with whom he studied. Long-standing members of the Society may also know him as a composer since a handful of his songs had been recorded during the early pioneering years of the BMS (BMS 403 - cassette only). Since the time of his professional retirement in 1997, Brian Daubney resumed his composing career and composed a huge quantity of songs with remarkable regularity and consistency. Incidentally, the Society�s archives hold a considerable number of volumes of his songs, no less than twelve at the time of writing, as well as other material. This brand new release includes seventeen songs written between 1999 and 2004, which give a good idea of Daubney�s "late flowering", to quote Stan Meares� phrase. Incidentally I am much indebted to Stan for providing me with some factual information concerning Brian�s songs. The thirty songs recorded here are all fairly recent, composed between 1992 and 2004, with the exception of John Anderson, my Jo (words by Robert Burns) and She hath an Art (words by Thomas Campion) that date from the late 1950s. His literary sources are quite varied, from fairly well-known to some less familiar writers and poems. Over recent years, he has composed quite a number of songs to words by the American writer Theodora Goss (born 1968) and by John Alan Davis (born 1929); but a quick glance at the names of the writers reveals wide-ranging interest with settings to words by Keats, Yeats, Hardy, Betjeman, Charlotte Brontë and Randall Swingler to name but a few. The variety of literary sources ensures a remarkable variety in musical settings avoiding any monotony which may often be the main shortcoming of song recitals. The comparatively early She hath an Art delightfully nods towards Warlock. I can imagine Brian�s eyes blinking with malice when writing this, whereas The Lent Lily and March (both to Housman�s words) bring John Ireland to mind, and none the worse for that. Other songs have an appropriately folk-like tone, such as John Anderson, my Jo and The Fiddler of Dooney (to words by Yeats) or the very beautiful Yeats setting The Lake Isle of Innisfree that sometimes brings Moeran to mind. Theodora Goss�s words, by turns deeply-felt and mildly ironic, find Daubney responding with equally vivid and eloquent tones. His setting of The Singer is one of finest here, very contrasted: declamatory, at times overtly dramatic and beautifully lyrical. John Alan Davis�s poems, too, obviously mean a great deal to Daubney, and some of the Davis settings are among the finest things in this recital. I particularly like I must go and sleep, the mildly ironic October Roses and Resurrection Spiritual, the latter alluding � both in text and music � to some exalted American Allelujah-shouting preachers, again with tongue-in-cheek irony. 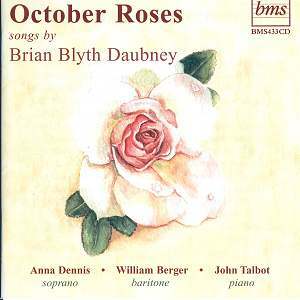 Brian Daubney is not afraid to set words that have been regularly used by generations of composers, such as poems by Housman (The Lent Lily) and Hardy, including Lyonnesse set by Gerald Finzi and by the Irish-born Gerard Victory, or Yeats (e.g. The Cloths of Heaven). However, settings of lesser-known poems also feature here, such as the deceptively simple but deeply moving On the Death of Anne Brontë (words by Charlotte Brontë) and the very fine Absence to words by Charlotte Mew, a name new to me. I was very happy to hear A Rose for Lidice to Swingler�s words again. This song was among the finalists of the 2002 Golden Jubilee Song Composers� Competition. I suppose that some know Rawsthorne�s beautiful choral setting of this utterly moving text, but Daubney�s own setting is equally moving for all its apparent simplicity. It would be idle on my part to go into detail about each of these thirty songs. They are all very fine, each one bringing off some facet of Daubney�s music-making. At the risk of repeating myself, I will say again that there is much variety here as far as literary sources and settings are concerned and much to relish. Daubney�s songs may not add anything new to the long British tradition of song-writing, to which they clearly belong, but they certainly breathe fresh air into it. Both singers obviously enjoy these songs and are superbly partnered by John Talbot, who again proves a very attentive accompanist. The recorded sound is very fine too, with some nicely natural piano sound and the voices not too close. In short, a most welcome release.